Your conference calls start at 7am Thursday but the final meeting ends at 11 for your half day vacation so you are able to get out the door before noon; giving you time to stop off at Snarfs for an Italian sub. You pick up a second New York Steak sandwich for tomorrow’s lunch on the trail. It’s been a full month since your last hike of segments 18 through 21 of the Colorado Trail and you don’t mind the 7 hour drive to Molas Pass on the Million Dollar Hwy south of Silverton to meet Tumbleweed for segments 22 through 24. Tumbleweed is parked at the trail head having arrived 15 minutes earlier at 6:30 pm. Had you not stopped for a Modelo Especial with chips and salsa at Anejos in Gunnison around 4pm, you would have arrived together. Amazing timing considering he departed from Grand Junction while you drove from Longmont. You remembered to bring some chairs this trip so you sit and enjoy a True Blonde while viewing the San Juans to the east that you’ll be crossing as part of this 3 day trek. You pitch your tents before heading into Silverton for dinner at Mother Kluckers. Just off Main Street, the place is a disappointment. Turns out the crowd is there to watch Thursday Night football on their abundant flat screens. 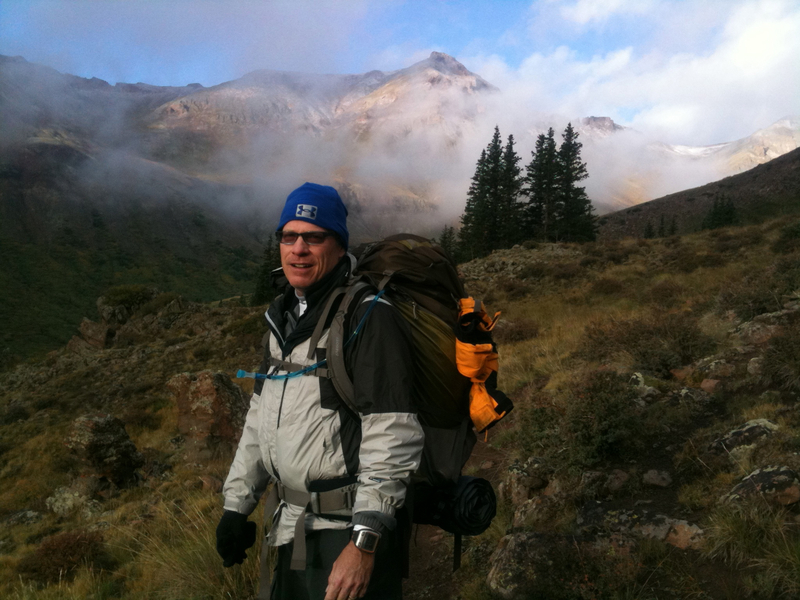 It’s strangely warm down in Silverton considering how cold it was up on the pass. 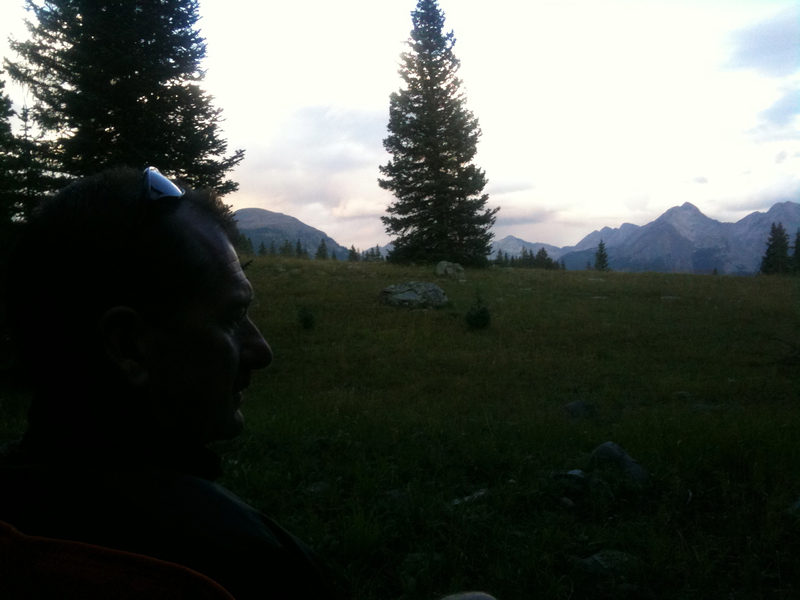 Upon returning to Molas Pass after dinner, you find it is warm up here now too. Nice. You sit down with Tumbleweed to watch a lightening storm and talk about tomorrow’s massive hike. You hope to avoid the 30% chance of rain expected for the entire weekend. This will be your first thru-hiking. Your first real backpacking really. You plan to take all your gear out of the car at the Spring Creek Pass trail head and jointly determine what to pack for the 3 day hike. You sleep well although your camp site is fairly close to the highway and there is a surprising amount of overnight traffic. You both rise shortly before 6am – certainly a late rise for Tumbleweed – to the sound of thunder. It fails to produce rain during your morning ritual however and you hit the Million Dollar Hwy for the 3 hour drive to Spring Creek Pass by 7am. You recharge your coffees at the Daily Bread on Main Street in Montrose. Lake City is a small hunting and fishing town near Spring Creek Pass. Looks like it will offer a decent choice of eateries for after you return here to pickup your car Sunday afternoon. The trail head is 17 miles up the hill from the town. Upon arrival, you meet Maximo, a fellow thru-hiker who just came down from Snow Mesa and is hitching a ride into Creede to wash up before continuing. He gives up however and heads back out ahead of you as you pack your gear. Maximo started the CT from Denver, same direction as you, with his sister and another friend, but they couldn’t make the entire hike into Durango. He’s prepared to finish in a few more days. You’re on the trail yourself by 11:30 – your latest start ever but you don’t necessarily have to stop at trail heads to shuffle cars on this outing. You have 2.5 days to cover 3 segments consisting of a little over 50 miles, and you can hike ’till dark or beyond if you so desire. You struggle finding your trail legs after a month off the CT and for the first time carrying a 50 pound pack. There’s incentive to eat early simply to lighten your load. Unfortunately your new Platypus hydration pack isn’t feeding you water very well. It might be clogged from not mixing your Cytomax well enough. Or perhaps it has a kink. It’s difficult to draw water from the hose so you fail to drink enough to maintain proper hydration. It feels cool enough that this shouldn’t be an issue, but it is. Your dehydration leads to altitude sickness. You become extremely nauseous for most of the day. Your weakness is nearly trumped though by the spectacular panoramic views of the most rugged mountain peaks in America. Locals call this the Switzerland of America – the Colorado Alps. It’s the most stunning part of the Colorado Trail without challenge. You reach the highest point of the entire Colorado Trail in mile 12 and know it’s downhill from here. Well, at least for this segment. 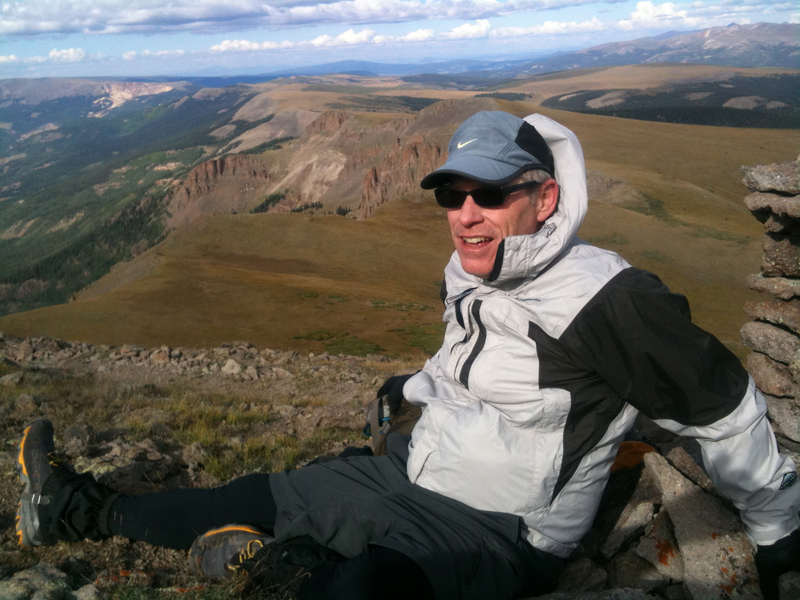 The high point is at 13,200 feet and you take some time to recover. You feel much more recovered once you finally drop below 12,000 feet as the nausea fades. 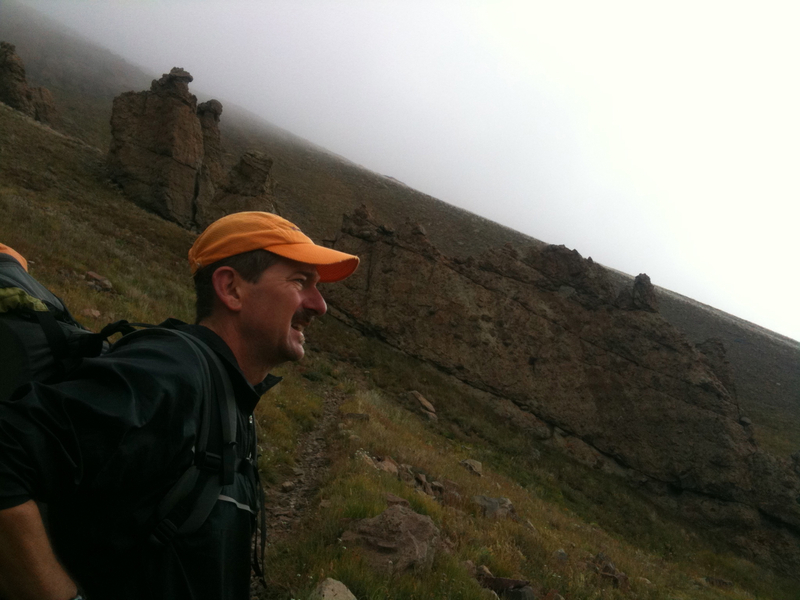 This entire hike has been in the 12K range above treeline. You left the trees behind at the trail head and haven’t seen many since. This section of the CT is clearly less traveled as even the trail itself disappears at times and you have to follow the cairns. You reach the Carson Saddle Trail Head near sunset given your late start and make the decision to hike further in order to reach a decent camp site. You want to reach the trees knowing it will be warmer and safer. Tumbleweed doesn’t think the trail will drop below treeline and he’s right. You hike a mile into segment 23 and decide to stop in some tall grass where you discover three other thru-hikers ensconced on the hill. Maximo is there. He shouts out at you and Tumbleweed as he hears you talking to Bill. And the third hiker is named Luke. This is a new experience for you as a thru-hiker. You’d find it more enjoyable but the nausea returns after you pitch your tent and you don’t even eat dinner. Regrettably, you retire to your tent and fall asleep hard. You awake around 11:30 to the sound of freezing rain hitting your tent. Despite the weather, the nearly full moon remains bright enough to illuminate the inside of your tent well enough to see all your gear. You fixed whatever was wrong with your Platypus and are able to drink water throughout the night. You fall back asleep until you hear Tumbleweed stirring around 5:30am. You join him for coffee feeling 100 percent better. You launch off on today’s hike well after the other three hikers in the cool, cloudy morning. The views keep getting better the deeper you crawl into the San Juans. Rocks just look better here. You’re stronger and feel up to a big day. Garmin actually captures you hiking a minute per mile slower on day 2 than yesterday, which is likely because you also climb 1000 feet more in elevation. 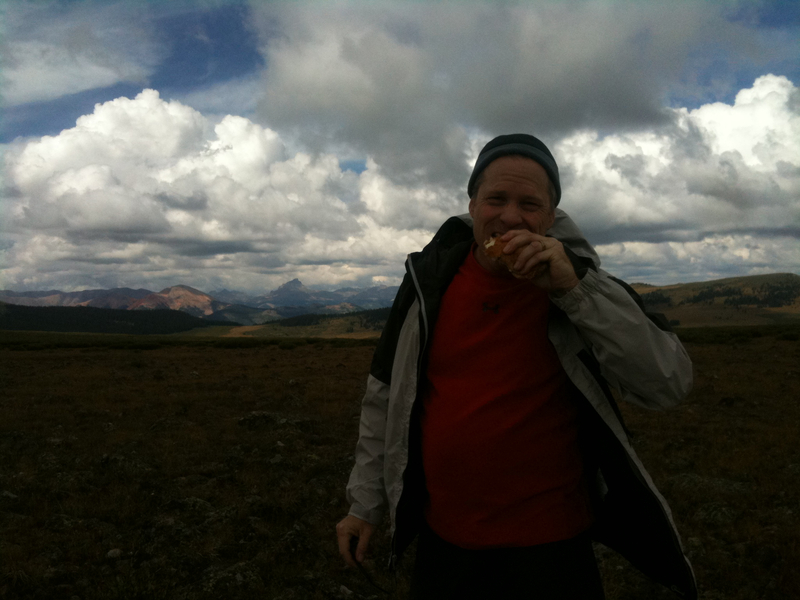 Still, you turn in an impressive 11 hour, 25 mile hike today almost entirely above treeline. Not until 23 miles do you begin a descent that will take you down to breathable air. And this is a 2000 foot drop in 2 miles. Nothing comes easy in today’s hike. You take solace in thinking you’ve chewed off the toughest 10 miles of segment 24 today, leaving you with only 11 doable miles for Sunday. Well, you don’t really know how doable tomorrow will be, but you know it will be all under treeline and that has to be easier. The 2 mile descent is technical. It begins with tight switchbacks and straightens out along the head waters to Elk Creek. Tumbleweed is cruising faster than usual for a steep decline and you’re playing catch-up. Or maybe you’re just really fatigued, still the pace is aggressive. You slip crossing the creek. Your left hand breaks your fall and keeps your face from slamming into a rock. You still don’t know how you did that without breaking your wrist. Perhaps more amazing is that your right toe dips into the running water for several seconds, up to the laces, but your foot remains dry. Damn those Gore-Tex La Sportivas are impressive. 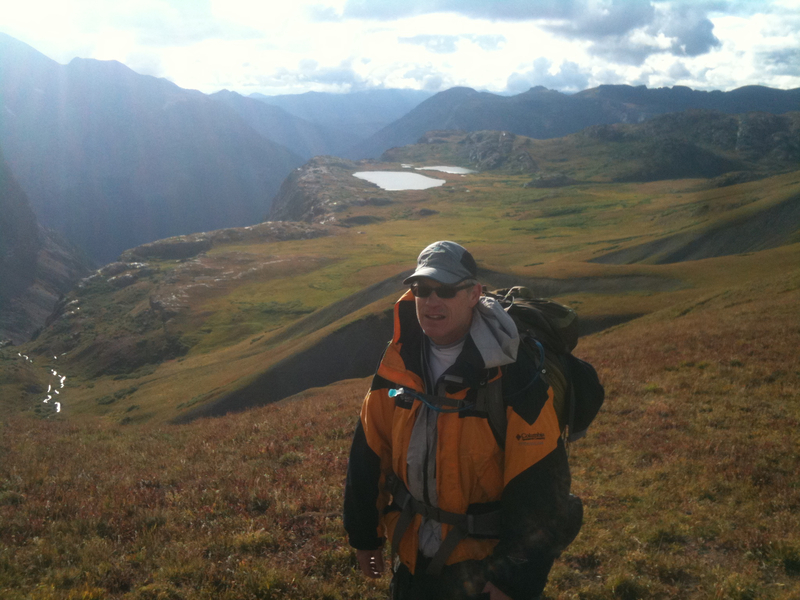 This picture of you with the lakes over your head shows the Elk Creek head waters before the descent becomes steep. 2000 feet lower you reach trees and Tumbleweed spots an awesome campsite. You pass on the first site and it pays off. This site is along the creek and has a fire ring. Tumbleweed struggles lighting the fire as the wood is all fairly wet. It’s like a micro rain forest down here. Eventually there is a roaring fire and your appetite has returned. After some pocket shots, you eat well and sleep even better. You rise early in a light rain, ready to get started on the remaining 11 miles. 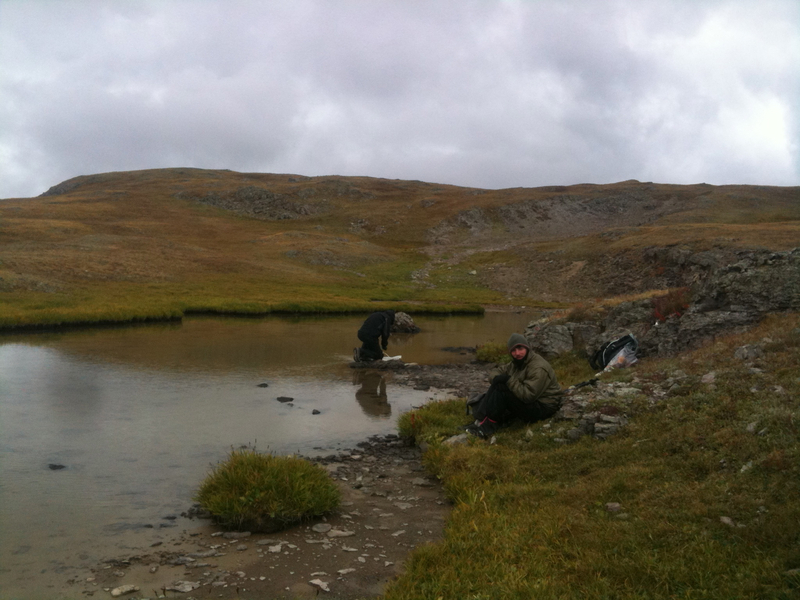 You hiked past Bill and Luke yesterday as they refilled their water in a small pond. You doubt they ever made it down from the tundra last night. That thought makes you appreciate the warmth of your heavily-treed camp site even more. 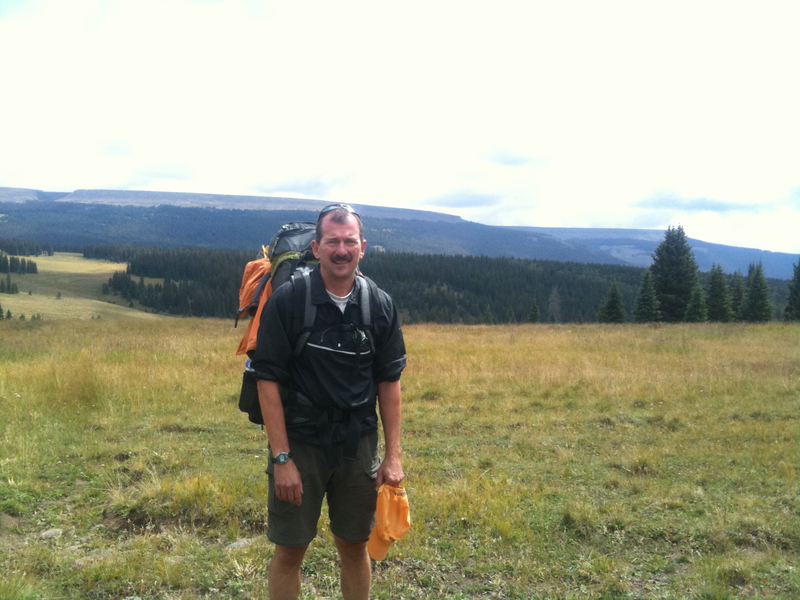 You wonder how far ahead Maximo is and you find him at his camp site about 2 miles into your hike. He’s planning on doing 30 miles today. You chat for awhile about bears in the area and he sends you off with a namaste gesture. Today’s hike continues to be tough as well as gorgeous. It finishes with a tremendous climb of well over 1000 feet, followed by a short respite and then a second small rise to Molas Pass. Never have you been so happy to see the trail head sign and shed your gear. You note the swelling from plantar faciitus in your left foot after having stripped off your shoes. You take some ibuprofen with a beer as Tumbleweed shuffles you both back to Spring Creek Pass for your car. You dine at the Smoke Shack in Lake City to average BBQ and recount your adventure. You have one last push scheduled for October and you plan the logistics. 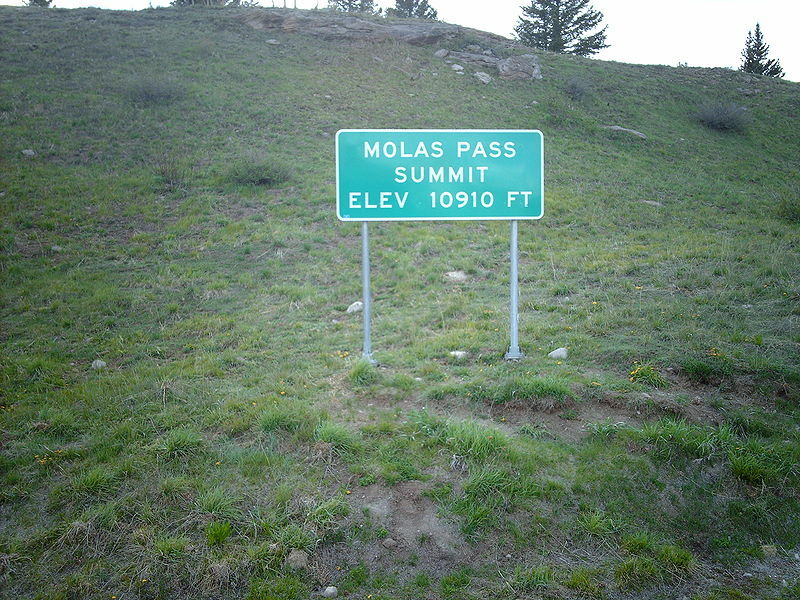 Molas Pass to Durango will be longer than this weekend, but at less extreme altitude and elevation gain. Totally doable.